You are here: Home » Six more weeks of Winter! Today is Groundhog Day! Every year on February 2nd, North Americans celebrate this exciting holiday, and wonder what will become of this year’s winter season? The tradition of Groundhog’s Day dates back to the mid 17th century, when a German shopkeeper in Pennsylvania noted that on this day, if it’s sunny and the groundhog sees his shadow he will return to hibernation for 6 more weeks of winter. If the day is cloudy and he cannot see his shadow, he ends his hibernation and spring is expected right around the corner. Famous weatherman woodchuck, Punxsutawney Phil’s “Inner Circle” swears that he’s never been wrong! So how does this pertain to you, you ask? Well, 6 more weeks of winter means 6 more weeks of long-sleeve chef coats, whereas an early spring season will mean that you can start checking out our short sleeve chef coats a little sooner this year! 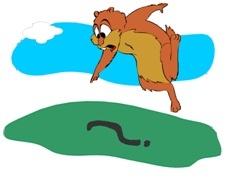 So what was Punxsutawney Phil’s (the most famous of the season-predicting groundhogs) prediction? It looks like we’ll be expecting six more weeks of winter this year! Check out a picture of Punxsutawney Phil himself below, as he broke the news in front of over 18,000 Pennsylvanians. What was your prediction for today? Let us know, is this good news or bad news?